Can you tell us how you came into contact with His Holiness Jayadvaita Swami, your spiritual master. How did you choose him and how did he help you in your progress in spiritual life? 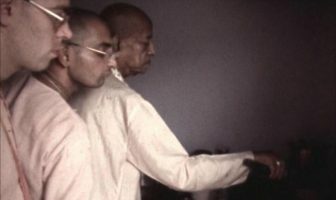 I met Jayadvaita Maharaj in Vrndavan in 1978 when he had just taken sannyasa . In Vrndavan, they have a counter with maha-prasadam in leaf cups. So he went to that counter and had grabbed a stack of those leaf cups. This is when I happened to be walking past him and said, “You really hungry there, Maharaj?” (laughter) I just needed to say that, didn’t I? Anyways, so Maharaj then went, “Oh good, you can carry them for me.” So I carried them all to his room behind him. 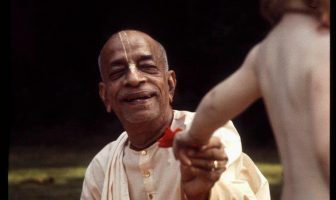 After having prasadam, he laid down on his bed, passed me the Krsna Book and asked me to read from it. After about 10 minutes, I thought he had dozed off, so I stopped reading and was about to tip-toe out of the room when I heard someone say, “Don’t stop reading!” So I started reading again and every 10-15 minutes, this kept happening. He continued to fall asleep, so I continued to escape, but then he continued to ask me to stay and keep reading about Krsna. This went on for another 1.5 hours or so! (laughter) Anyways, so this is how our relationship started and it eventually evolved to a friendship which then eventually evolved into a guru-disciple relationship.